The work of Domestic Violence advocate Sue Day Banham will be on display at Lithgow Library from 2 to 31 July 2018. “With such an array of diverse artists on display there is always something to experience at the Library,” said Mayor Stephen Lesslie. “This artist is dedicated to such a worthy cause, this art exhibition is not to be missed”. Sue Day Banham is the founder of charity ‘Stop all Domestic Violence’ and is also a published author and illustrator. Her exhibition will include paraphernalia from her charity and artwork from her published children’s books. This eclectic mix will be on display during July in the Lithgow Library during the Library opening hours of 9am to 6pm Monday to Friday and 9am to 12 noon on Saturdays. For more information on this exhibition or to enquire about exhibiting at the Library phone 6352 9100. Record numbers attended the Australian Heritage Festival event at the library on Saturday 19 May 2018. 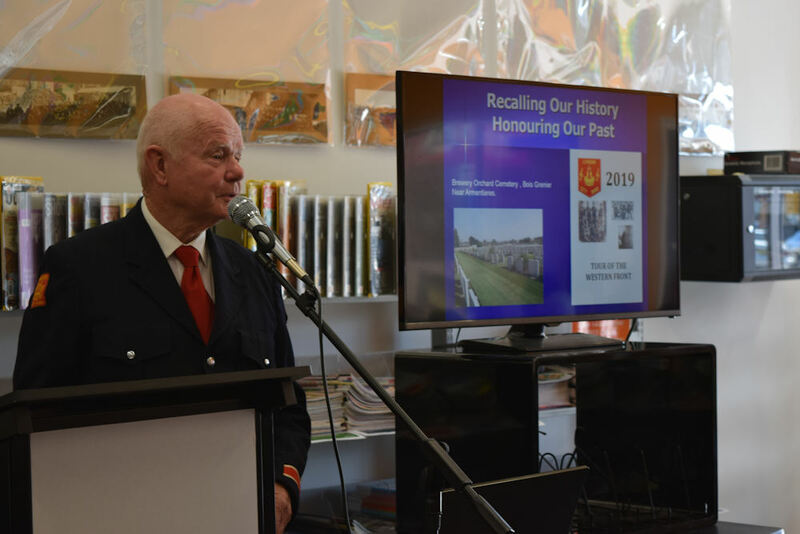 The event began with a superb performance by the Lithgow City Band followed by guest speakers Don White, Vaughan Bryers and Ray Christison. The feedback was excellent with many asking to be notified about future events. Please contact the library if you would like digital copies of the exhibition items and/or presentation information. The next library local history event will be during History Week in September 2018. On Thursday 24/5/18, the Lithgow Library Learning Centre hosted the Biggest Morning Tea, in aid of the Cancer Council of NSW. The library was buzzing with an estimated 100 participants, all eager to enjoy a delicious spread provided by the library staff and through a generous donation of baked goods from Bill’s Old Fashion Cakes and Pies. The library Ukulele group provided upbeat entertainment that had the crowd singing and dancing in the aisles! Library staff had also donated a range of “thank you for donating” prizes. The event raised $458.50 for the Cancer Council. Library staff would like to send a BIG thank you to everyone who attended and supported this worthy event. The Star Observer is a free monthly magazine and online newspaper with social media channels that caters to the lesbian, gay, bisexual, transgender and intersex communities in Australia. This month check out articles from leading voices in the Australian LGBTIQ community and get the update on upcoming events, concerts and social highlights. You can pick up your own copy of Star Observer to take home at the Lithgow Library Learning Centre. Membership is free at Lithgow Library, and our branches at Portland and Wallerawang. Please contact us on 6352 9100 for more information. The Ahmadiyya Muslim Community is a dynamic, fast growing international revival movement within Islam. Founded in 1889, it spans over 200 countries with membership exceeding tens of millions. The group will be holding an information display throughout the month of June in the Lithgow Library. Ahmadi Muslims all over the world are engaged in efforts to distribute millions of ‘Peace’ leaflets to Muslims and non-Muslims alike, host interfaith dialogue and peace symposiums, and present exhibitions of The Holy Qur’an, to present its true and noble message. These campaigns have received worldwide media coverage and demonstrate that Islam advocates peace, loyalty to one’s country of residence and service to humanity. The display throughout June in the Lithgow Library aims to provide residents with more information on the Ahmadiyya Muslim Community and the work that they do. As part of the display a model of the Baitul Huda Mosque (House of Guidance) in Sydney will be in the foyer cabinet. “This is an opportunity for Lithgow residents to become more aware of the Islamic faith and gain an insight into their commitment to bringing peace to the world,” said Mayor Stephen Lesslie. Information will be on display throughout June in the Lithgow Library and members of the Ahmadiyya Muslim Community will be available for questions in the Library after school hours throughout the month. For more information contact the Lithgow Library on 63529100. Lithgow Library is continuing its tradition of providing quality information by highlighting some of the varied organisations in the Lithgow community. Lithgow Boomerang Bags, an organisation with an important environmental message, will be holding a workshop and launch in the Lithgow Library on Friday 8 June 2018. Lithgow Boomerang Bags is a community driven initiative tackling plastic pollution at the grassroots level. Dedicated local volunteers get together to make re-useable bags utilising recycled materials as a means to provide a sustainable alternative to plastic bags. Lithgow Boomerang Bags will be holding a launch and community workshop in the Lithgow Library on Friday 8 June 2018 from 10.30am to 4.30pm. Everyone is welcome to come along throughout the day and learn more about this worthwhile project. Members of the group will be sewing bags throughout the day and there will be information videos on the project and the effects of plastic pollution. “There are many organisations in the community who go about their business and find it hard to get the word out into the community about the work they do. This initiative by the Lithgow Library to highlight community organisations is an opportunity for others to discover what is available here. I urge all community organisations to consider holding an information session at the Library,” said Mayor Stephen Lesslie. For more information contact the Lithgow Library on 6352 9100. Boredom busting Board Games are back! Every Monday during term 2 come into Lithgow Library for some old fashioned fun. Board game group will be running at Lithgow Library every Monday during Term 2, from 4.00-5.00pm. The club is suited to all ages and is a great way to meet new friends and have fun with some classic games. This inclusive club will be run by student volunteers. Lithgow Library has a great range of fun, classic, educational and age appropriate board games. Board games are a great alternative to technology, and a welcome break from study. So come down to the Library on Monday afternoon to enjoy this free program. Refugee Week 2018 from 17-23 June is a time when Australia celebrates the contribution of those who have come to Australia as refugees and people seeking asylum. “Like the rest of our country, Lithgow has benefitted and grown from the contributions of refugees and people seeking asylum coming and making a new home here in our community,” said Lithgow Mayor Stephen Lesslie. “Refugee Week is an opportunity to learn more about the stories of our refugee community and to understand the lives and struggles and joy of some of our newest Australians”. Throughout Refugee Week, in the community space at Lithgow Library, there will be a screening of a series of rolling film clips from the Red Cross and Amnesty International highlighting issues refugees face. This film will be playing on a loop all week so you can drop in to the Library and watch all or part of it at a time that suits you. On Wednesday 20 June, World Refugee Day, there will be an information session presented by the Red Cross called “What’s the real situation faced by people seeking asylum?” This session will be at Lithgow Library from 2.00pm. Topics covered include: who are people seeking asylum; what situations do they face; and what does Australia have to do with it? Come, join the conversation and participate in an engaging workshop. There will also be an art exhibition during the month of June that has been organised by the local LASAR action group (Lithgow Asylum seeker and refugee Support Group). These events are all free at Lithgow Library – no bookings are required, everyone is welcome to attend. Every year in May, the war against cancer is waged using cups of tea, coffee, cake and scones! Some skirmishes have been won, research and support services are being funded, but the war is not over yet. This year marks 25 years for the Cancer Council’s, Australia’s Biggest Morning Tea, a celebratory event which has been bringing people together in support of those with cancer. Sadly we all know someone that has, has had or will have cancer. The Cancer Council Australia puts the funds you donate to work, funding research to the tune of $60 million across Australia. They provide support services by answering over 47,000 calls, developing programs to encourage healthier lifestyles and, advocacy to change laws and policies to reduce cancer risks and improve cancer care. 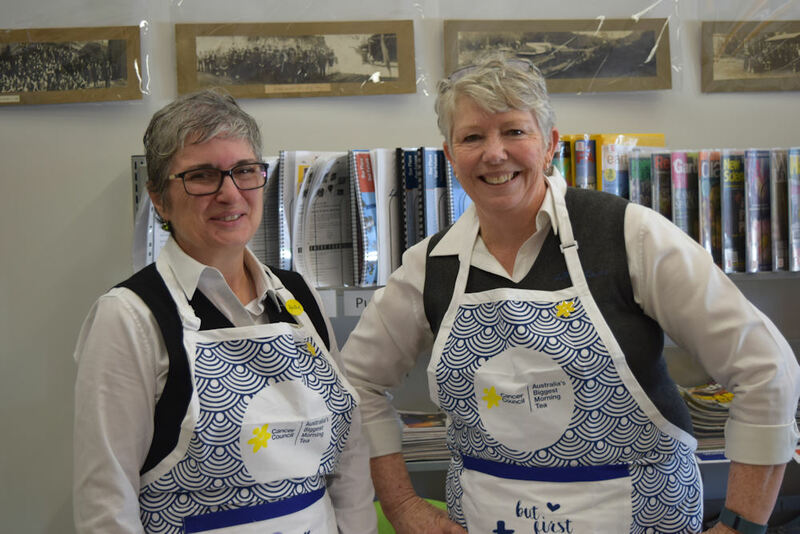 “Every cup of tea is one more step in the right direction to fight cancer, and events like the Biggest Morning Tea at Lithgow Library help to fund support and care, ” said Lithgow City Council Mayor Stephen Lesslie. Join the staff of Lithgow Library on Thursday 24 May 2018, from 10.00am to 12 noon to show your support for this amazing event. There will be a café serving tea, coffee, cakes and savoury options. A gold coin donation is all that is needed to take part and help us fight this war! Now in its 18th successful year, National Simultaneous Storytime is an annual campaign that aims to encourage more young Australians to read and enjoy books. Join us at Lithgow Library on Wednesday 23 May at 10.30am as we celebrate this very special Storytime. Every year a picture book, written and illustrated by an Australian author and illustrator, is read simultaneously in libraries, schools, pre-schools, childcare centres, family homes, bookshops and many other places around the country. This year’s picture book is ‘Hickory Dickory Dash’, written by Tony Wilson, and illustrated by Laura Wood. This hilarious look behind the scenes of the famous nursery rhyme may remind readers of last year’s book by the same author, ‘The cow tripped over the moon’. The Library invites all pre-schoolers, their parents, grandparents, and friends to come along to join in our Storytime session, which includes stories, songs and craft. No bookings are needed, just come along and join in the fun.